A Belgian music festival, which prides itself on its horse-meat sausages, is going meat-free on the day that vegetarian singer Morrissey performs. The 10-day Lokerse Feesten, which boasts online about sales of sausage rolls and snails, will order stalls to sell vegetarian food only on 4 August. Organisers said "one meatless day" out of 10 was "a healthy break for all". In 2009, the singer left the stage at California's Coachella festival saying he could "smell burning flesh". According to Coachella festival-goers, the singer then added: "And I hope to God it's human." 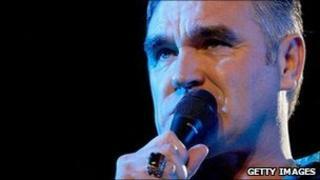 The Lokerse Feesten said it had "dreamed" of booking Morrissey for year. "Many months we worked on it, for weeks we waited for an answer, many nights were spent sleepless," it said on its website. The booking "meant a welcomed catering challenge for one day", it added. "Our food stalls will be serving you an array of healthy vegetarian dishes."